1. Give something up for a month and blog about the experience. Eg. Chocolate, fizzy drinks etc. 2. Blog about your top 5 holiday destinations. 3. Share your favourite blog posts that you've read that week/month. 4. Review the last book you read. 5. Take an item of clothing out of your wardrobe and show how you'd dress it up from day to night. 6. Share an old family recipe. 7. Write a list of tips for new bloggers. 9. Take your camera out on a walk with you and share some photos. 10. Share your worst baby photos, go on, it'll be a laugh. 11. Write an about me post or update it if you've already got one. 12. Share the names you wish you had. 13. Blog about an issue that you feel passionate about. 14. Try a DIY from Pinterest. If it turns terrible then that's even better. 15. Pick a colour and show some of the things you own that are that colour. 16. Do a room tour of your bedroom or office. 17. Show us your bookshelf. 18. 10 things to do to brighten your day. 19. 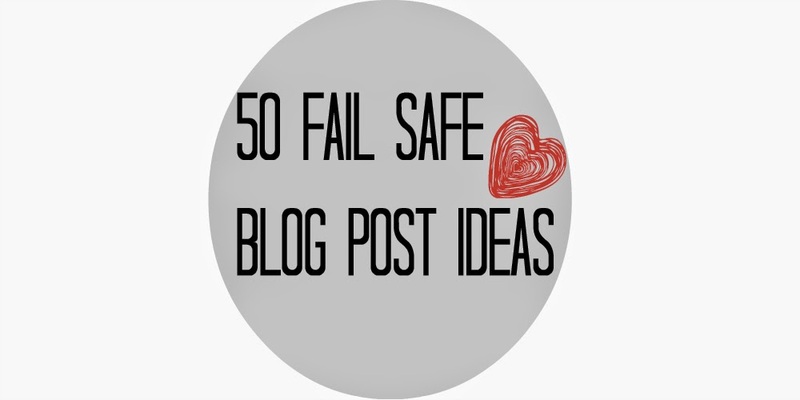 Write a list of blog ideas for other bloggers! 20. Share your favourite blog posts that you've written over the years and why they're your favourites. 21. Do some spring cleaning and blog about what you did. 22. Blog about all the pets that you had growing up. Didn't have any pets? Blog about the ones you wish you had. 24. Create a blog roll. 25. Write a list of 101 Things To Do In 1001 Days. 26. Blog about some of the things that you've ticked off your 101 Things list. 27. Show us your go to hair and make up. 28. Share some old fashion disasters. 30. Post some tips on something you're good at(see 5 Ways To Read More Books & 5 More Ways To Read More Books). 31. Blog about a beauty product you hated. 32. Write a post about your favourite movies. 33. Share some unpopular opinions. 34. Do a tag post. 35. Blog about a beauty product you love. 36. Blog about what you do to pamper yourself. 37. Share some studying tips if you're still a student. 38. Show us your top 5 nail polishes for the season. 40. Take a photo of you from when you were a kid and try and replicate the outfit that you were wearing in it. 41. If it's near Christmas then write a gift guide. 43. Blog about your favourite blogs and share the love. 44. Give a shout out to the readers that you see cropping up time after time in the comments. 45. Share your favourite 'go get em' songs'. 46. Blog about your favoruite candle scents for the season. 47. Review one of your favourite local restuarants. 48. Share some of your favourite YouTube channels and a few of their videos. 49. Post some of your favourite things that you've found on Pinterest(remember to source). 50. Blog about one of your hobbies(beside blogging).